Leadership is a capability to lead, its an acts of Organizin, Motivating, Inspiring, and Directing a group of people towards getting a purpose or goals. Everyone had the capability of been a leader, the moment we are given birth, we are leaders. We have our lives to dictate, but its all depends on how individuals acts before he/she becomes a leader. CIRCULAR LEADERS; examples includes our politicians like President, Senators, Governors, Chairman etc. Those who are elected my people into one office or the other. 1. A good leader must be responsible, this means taking responsibilities and challenges. 2. Must be courageous and fearlessness. 3. Must be exemplary in the sense that he/she must always show good example to his/her followers. 4. A good leader must be humble, meekness, respectful and placing him/herself below others. 5. Must be easily accessible, always smile and open to others. 6. A good leader must be productive, setting long term and short term goals and must achieved such goals before the stipulated time. 7. Understanding limit, leaders needs to know boundaries. Sometimes, good leaders have to limit him/herself to some certain things.The way they talk, smile, laugh or eat. 8. As a leader, you must have a mentor in which you should look up to. For we Christian, Jesus Christ is our mentor. 9. Must watch out for and avoid common pitfalls of leadership. 10. A leader must be emotionally aware. You must understand people's situations and conditions. 11. A good leader must be a good listener and be teachable. 12. A good leader never stop improving, must keep learning everyday, improve in characters. 13. Leaders must be able to tolerate lots of things from his/her followers, must be patient and always be calm before given any judgement. 14. A good leader doesn't speak good of anyone and must caution any followers that is doing so. 15. A good leader must act rather than saying. 16. And finally, good leaders must be prayerful, praying for others, nations. Must be rich in the word of God. 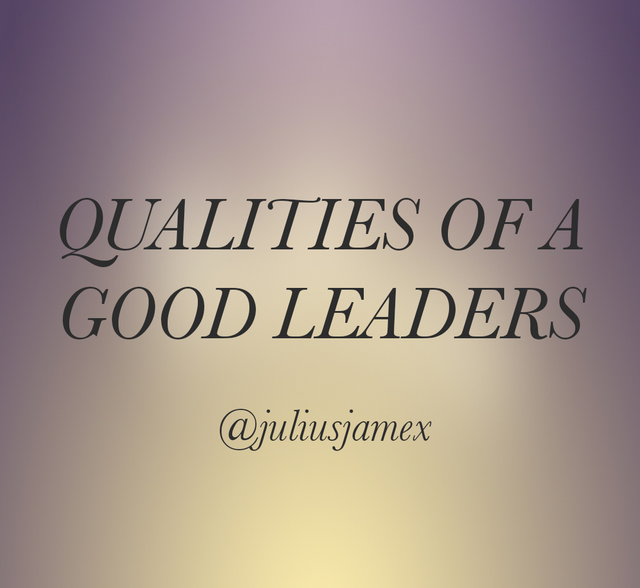 With those few points of mine, I hope you must have learn 1 or 2 things about who good leaders are. You got a 44.44% upvote from @steembloggers courtesy of @juliusjamex!